When it comes to evaluating influencer reach, many marketers (especially those within the PR agency space) continue to measure a blogger’s performance by dividing their unique visitors per month (UMV) by 30. UMV forms the basis of many web analytics. Since it counts individual visitors rather than repeat visits, it’s traditionally believed to offer a sense of a site’s true audience size. While this is true, when looking at a blogger from a macro perspective (i.e., generally comparing one blogger to another), it doesn’t offer any insight into the impressions that an individual post will get through influencer campaign management. Is Using Unique Visitors an Accurate Way to Measure Influencer Reach? 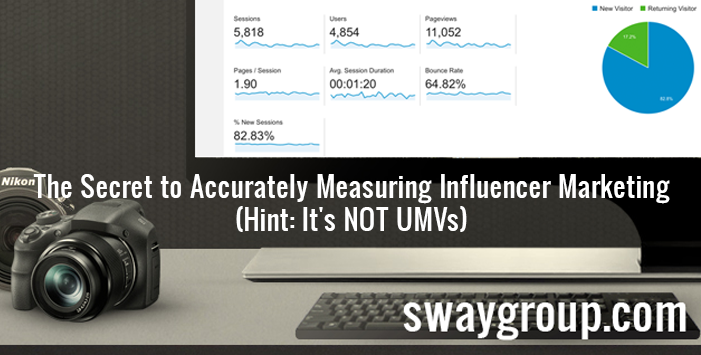 At Sway Group, we don’t use UMV as a metric for our influencer campaigns. Despite its popularity, a site’s unique visitor count is not an accurate way to predict sponsored post impressions. Audiences aren’t reading blogs the way they used to. Moreover, instead of returning to a favorite site each day to see what’s new, they’re arriving via search engine, social media, or RSS feeds. This is why we include social media amplification on posts – to alert readers that something new and interesting is live. In other words, UMV has no real bearing on impressions generated on an individual sponsored post, aka influencer reach. Sway Group has developed a proprietary tracking pixel system that measures ACTUAL impressions and visitors on each of our sponsored posts. We then provide each of our influencers a unique tracking pixel to embed within their post. By doing so, this ensures each of our clients get detailed engagement info on their entire campaign. Rather than accounting for traffic that hits any part of a website, we measure the post that’s specifically associated with the sponsorship. We provide relevant site stats including page views, uniques, clicks, and CTR. However, our campaigns aren’t just blogs. We track Social media programs as well, so we can report on hashtags, impressions, likes, comments, shares, pins, and more. Our numbers are exact, because we know that’s far more useful than an irrelevant estimate. Every marketer wants to reduce uncertainty. So even though Sway Group’s proprietary reporting tools can’t predict the future (yet! ), we can definitely help take the guesswork out of campaign ROI. Let Us Help You Track Your Next Campaign!